Mrs. Gwendolyn Rooks On June 2, 1949, a beautiful little girl was born to Ollie Williams and Edward Perkins in Chicago, Illinois.Gwendolyn, affectionately known as Gwen, was the third of four children. Both parents and her brother -Warner Williams Jr. preceded her in death. At an early age she accepted Christ under the leadership of her family’s Baptist teaching. However, she later, became a Hebrew Israelite in 1995. Gwen was raised on the Westside of Chicago, in the North Lawndale Community where she attended Medill Elementary School, Hess Upper Grade Center, and Farragut High School of which she graduated in 1968. After High School, she attended Loop Junior College, now known as Harold Washington College, where she majored in Early Childhood Education. In 2010, she retired from Chicago Public Schools after twenty-one years of service. Gwen developed a passion for sewing,walking in the footsteps of her grandmother and great-grandmother, both of whom were seamstresses for Marshall Fields & Company. She enjoyed reading, cooking, playing cards (bid whist), dancing,and listening to music,especially her “dusties”. But above all, she loved to create and design her own style of dress,which she called her fashion masterpieces, that were all one of a kind. On November 1,1974, Gwen married Alfred Rooks, they were married for over forty-four years.They were blessed to share three children and five grandchildren. Gwen was a Community Advocate for the youth in her neighborhood. She fought to bring programs and activities to the North Lawndale and Austin areas. She organized block club parties, sponsored trips outside of the neighborhood, designed outfits for entertainment events and was the first cheerleader coach for John Hay Elementary School. Gwen helped in landing them several championship awards and a television performance on the show “Kidding Around” which aired Saturdays on the NBC television station. In her later years, she appreciated various cross word puzzles, with her favorite being Sudoku. She also grew to love coloring and the annual Farragut High School Picnic. 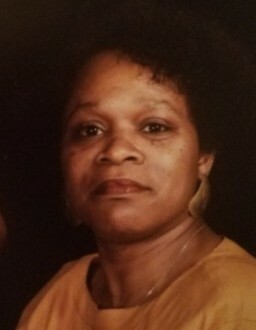 Wife, mother, sister, aunt, cousin and friend, Gwen was the person you wanted in your corner, as she was faithful, loyal and dependable, a person of her word. She was also very creative, studious, with an outstanding sense of humor. However,quiet and reserved in nature, you didn’t want to rub her the wrong way. Her presence alone demanded respect.She was “Aunt Gwen” to all her nieces and nephews. Her love for family and special friends was everlasting. On March 12, 2019, at 4:05 p.m. Gwendolyn passed away, due to several medical issues. Her last days were spent surrounded by family and friends. She didn’t give up; her body just gave out. No matter how much she suffered she lived a life with Social Grace. She believed that her “Goodbye was not forever” John 5: 28-29 ". Gwen leaves to cherish her wonderful memories: her husband, Alfred Rooks; one daughter, Yolanda Williams-Cocroft (Ollie);four Sons, Eeon Williams, Jamal Rooks, Anthony Rooks and Andre Rooks;five grandchildren, Brandon and Bryan Cocroft, Eeon Rooks Jr.,Najhal Rooks, and Nevaeh Dennis;three sisters, Carol Washington, Deborah Williams and Bennie Rush;one Brother, James Meeks;four nieces, Ruth Preyar (Anthony), Debra Washington, Gwendolyn Armstrong and Tanika Williams-Lacy (Kejuan); four nephews, Carl Williams (Martha), Reginald Williams, Alphonso Williams and Nickolas Washington, and a host of cousins, great nieces and nephews, (which she loved dearly),many dear friends and let’s not forget her St. Louis neighborhood and Farragut High School families.